The late Dr. Shigo once professed to me "If you want to be an expert, find the 10 most common trees that grow in your region and get to know them. Really, really, get to know them." Being a smart-aleck I asked him if this was some kind of contest or something. Having no sense of humor for my shenanigans, Dr. Shigo explained that I should make a list of the most common trees on my customer's properties and get to work at discovering what makes these trees tick. What trees would you add to the list? What trees would you subtract? Though it is the colossus that shades the streets of Savannah and is the state tree of Georgia, the Live oak Quercus virginiana continues to be overlooked as a potential landscape or specimen tree in Atlanta. Live oaks embody many of the sentimental qualities that are often associated with a southern oak: expansive, rich with character, and hauntingly lyrical with tales to tell of children and families meeting beneath the shadow if its weathered limbs. Its popular detraction is also its greatest asset. Slow growing, but conservative. Yet given the right conditions of bright sunlight, moisture, and well-drained soil, this tree is moderately, even fast-growing, in youth. Over time, this tree can outperform and outlive some of the more cosmopolitan oaks such as Willow oak and the newest urban dweller Nuttall oak. 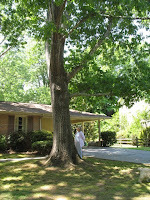 It is a recommended southern landscape tree by Michael Dirr. Congratulations to Nonot, who's estimate came the closest in May's contest. The Scarlet oak, located just a few miles north of Atlanta, is 42 years old this year. When Fulton County installed the sewer line my children told me to come down and look at the creek where they cut down all the trees. When I walked down there I saw this tree that had been pushed over but the bark wasn't skinned off of it so I dug it up and brought it home and planted it and the other one over there. So we estimated the tree was about 3 years old when she planted it. That was 39 years ago! Here is a neat little Atlanta Tree Ordinance hack of which you may not be aware. Most people know, to remove any healthy tree 6 inches or greater in diameter requires cash recompense be paid to the city (or tree replacement), along with a city-approved tree removal permit. Fewer people know that the minimum size for pines is 12 inches in diameter. But what most residents don't know is that there are several tree species that are considered so heinous, so undesirable, so horrid...that they do not require paid recompense, replacement or posting.